In October 2014, with the encouragement of Annie Duffy, a UAF Art Department faculty member and mentor, I presented my thesis work at the Arctic Regional Division of the American Association for the Advancement of Science (AAAS) Conference. At the time I saw it as a great opportunity to not only practice presenting my thesis, but also present my research to a different and more diverse audience. Never in my wildest dreams did I imagine that this presentation would enable me to travel and present nationally!! I received the Larus Award which granted me full funding to attend and present at the National AAAS 2015 Conference in San Jose, CA. What an honor! The San Jose Convention Center, 2015. The conference was six days of exciting lectures, symposia, presentations, and seminars on cutting edge research in the fields of physics, earth science, chemistry, math, and social sciences just to name a few. As an artist/anthropologist attending the event, the topics and lectures were new and fascinating. There were lectures about science and communication; how is science and scientific fact presented to the public, what is the dialogue between science and religion and how can they work together, what about science and the community, how can we get the community at large involved with and excited about "citizen science", how do we encourage young girls to become scientific leaders, and how can we integrate the STEM (Science, Technology, Engineering, and Math) Program in school curriculums. Other topics included cutting edge research and integration of GPS mapping to better understand, document, and map out endangered languages; isotopic analysis of remains in Anglo Saxon cemeteries to compare and contrast the written history of the time period to scientifically derived fact to paint a new and more accurate picture of the people; and state of the art visualization of classical masterworks of art, including face recognition, computational art history and conservation, and multiband imaging using infrared spectroscopy. I'm so grateful to the Annie, the University of Alaska, the Larus Award, and all the wonderful people I met at the conference. It was a remarkable experience! I've learned a great deal more about art, science, and the potential collaborations that will further our knowledge of historic works of art, culture groups, and how we can participate in science every day! I even learned a little bit about dark matter and our galaxy--now to incorporate that into my next body of work--now back to the studio! My MFA experience has been quite the journey. I've been able to work with and learn so much from the many amazing people involved with the UAF Art Department. Jim Brashear has been a wonderful mentor and from him I've learned about firing atmospheric kilns, how to relate my anthropology degree to the history of ceramics, and how to be a mentor to my own students. Working with Teresa Shannon has been a pleasure. She's helped me through many technical debacles and seemed to always be on call for me. Mike Nakoneczny has been my best critic and kept me on task making sure I was aware of many of the imminent deadlines, that otherwise would have made a nice whooshing sound as they passed by. Mareca Guthrie, Art Curator for the UA Museum of the North, has also been a wonderful advocate and supported my ideas in clay. To the many others; Angela Linn (UAMN Collections Manager for the Ethnology and History Collections) Carol Hoeffler, Zoe Jones, David Mollett, Annie Duffy, and the rest of the faculty in the art department, Robin Shoaps (UAF Anthropology faculty and outside committee member), and to my many amazing students, THANK YOU!! My thesis exhibition occurred in two parts; first an interactive exhibition, “An Artful Experience: Dining Out,” a catered event exhibited at the UA Museum of the North, then a gallery exhibition in the UA Fine Arts Gallery, of the ceramic ware, “Dining Out” An Artful Experience”. I created sixteen place settings; each consisting of a dinner plate, salad plate, soup bowl, and tumbler, as well as serving ware for the dinner. These, in addition to other utilitarian ceramic ware, were displayed for the exhibition. Ceramics play an important role in our daily lives. Our day is marked by situations that revolve around eating and drinking. These moments create opportunies for social interactions, allowing us to share experiences and stories to create and strengthen relationships. For my thesis, I wanted to create an event and environment in which my ceramic ware could foster sociality. 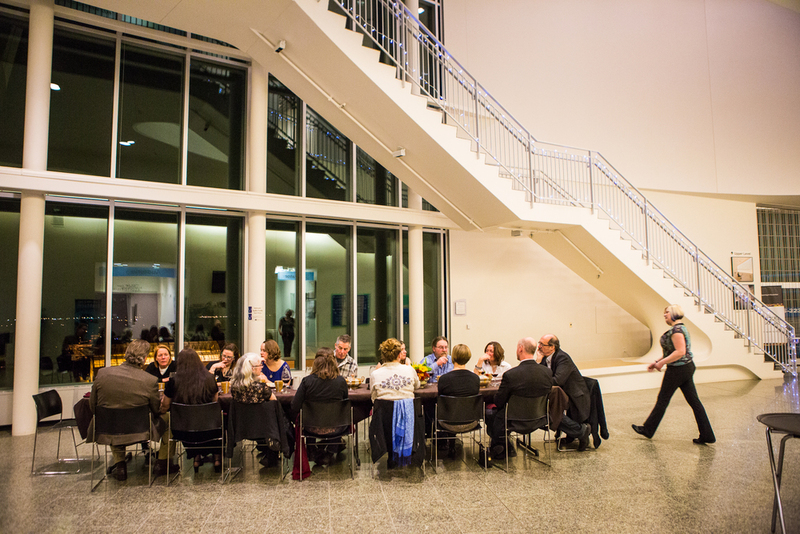 The dinner was held at the University of Alaska Museum of the North. This particular museum, renowned for its rich natural history collection pertaining specifically to the North, was the perfect context for the event because it not only displays the objects that inspired me, including story knives and many other artifacts, but also reflected the intention and purpose of the anthropological inspiration for my work. 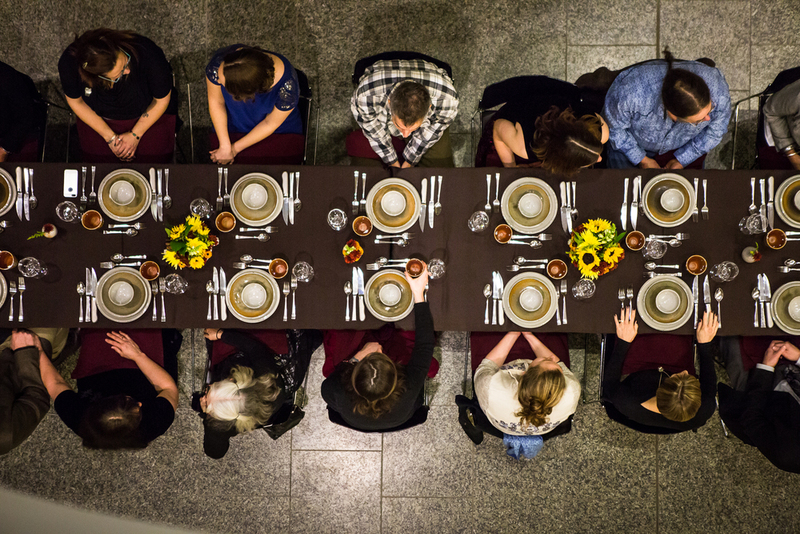 Image of gallery exhibition at UAF Fine Arts Complex, “Dining Out: An Artful Experience”, 2014. The gallery exhibition referenced the interactive exhibit as well as set the stage for my ceramic ware. Individual pieces were put in the spotlight and seen for their form, color, and design without distraction of utility. The sixteen place settings were centered on a table in the gallery and arranged as they were for the dinner. Other ceramic pieces, bowls, pouring bowls, coffee pots, coffee drips, teapots, creamers, sugar jars, pitchers, and more, were all displayed on wall units surrounding the table. These objects, while not directly used in the interactive exhibit, still conveyed the theme of use and shared experiences over meals or beverages. Between the shelving units were five photos (taken by J.R. Ancheta) of the interactive exhibit. The photos serve both as a reference to the interactive exhibit as well as a reminder of the utility and purpose of my ceramic ware – to serve, be shared, and create community. In anthropological history, ceramics has been predominantly used as a vessel. However I see the potential of ceramics to also contain not only liquids or other foods, but also to contain memories of events or histories. During the interactive exhibit attendees had a chance to interact with the work and thus activate it. They were able to feel the feet on the plates and bowls, noticed the color of glaze, felt the form of the tumblers in their hand, and touched the rim to their lips as they drank. The dinner allowed the work to come alive and created an opportunity for interaction and sharing, something not offered by an exhibit that solely displayed the vessels in a gallery setting. The beauty of utilitarian ceramics lies in its ability to create community through social interactions while nourishing the body. The forms and line work of my ceramics reference the ethnographic material that has inspired me. Handmade pottery serves as a reminder of the time-honored rituals, processes, and objects that embellish and enrich our daily lives. Those who use the vessels will create and contain their own memories through their continued use. This past week has been full of research! I had been asked to give a presentation on my art and inspirations for the 2014 Arctic Science Conference in Fairbanks. I took this opportunity to try and figure out what exactly it was about Anthropology that inspires my work as a ceramic artist. Putting together this presentation made me ware of the many ways I reinterpret anthropology; by adapting the visual elements of the Northern ethnographic material that I research and work with at the University of Alaska Museum of the North and link anthropological meaning to utilitarian ceramics. Ceramics has a long history, dating back to 9000BCE of being used as a vessel to contain grains, wine, oil, and other foods. These vessels were decorated with images or patterns that documented a time, place, mythology, and heros of a particular group of people. Today we still use ceramics--jars, teapots, bowls, coffee mugs, tea cups, platters, plates, the list goes on! In my work, I try to communicate anthropological concepts and inspiration from the place that I live in, the North. Perhaps the most fascinating thing about these cultures for me is the connection between the people and the animals, living off the land, the connection between the spirits and the cosmos, and the way that the people of the north found balance in everything. Traditionally much deference and respect is paid to the spirits--they controlled the conditions of the hunt, the weather, wealth, misfortune, and accidents. In order to keep the favor of these spirits, certain rituals were observed (depending on what needed to be alleviated) to appease the spirits and return balance to the community. Shamans were the main communicators with the spirits, however, each person was able to take precautions and observe taboos to keep the spirits happy. Detail of an ivory Yup'ik harpoon head. University of Alaska Museum of the North. Many ivory objects are ornamented with incised lines that are then filled in with lamp black (a mix of oil and soot from the oil lamps) and rubbed away, like scrimshaw. Working bone and ivory into tools and weapons was considered more than just a necessary task. It was believed that if great care was taken when working with the bones and materials from animals, then the animal would be attracted to the hunter without hesitation, almost offering itself. The lines that ornament the ivory and bone tools, weapons, handles, sewing kits, etc all show respect to the spirits and animals. There are also many different kinds of marks found on objects. For example, wooden spoons or bowls would be more elaborately painted with ochre or blood with images and decorations that would have been passed down from generation to generation. Many of these marks are ownership marks, that showed who the item belonged to. These marks would then be simplified on the tools or weapons so that owner could be identified. Another object that I've been particularly drawn to are Yup'ik story knives. Story knives were gifted to young girls and with them they would illustrate stories in the snow or mud (depending on the season) with symbols that would narrate the story. These stories could be real, make believe, or myths told to them by elders. 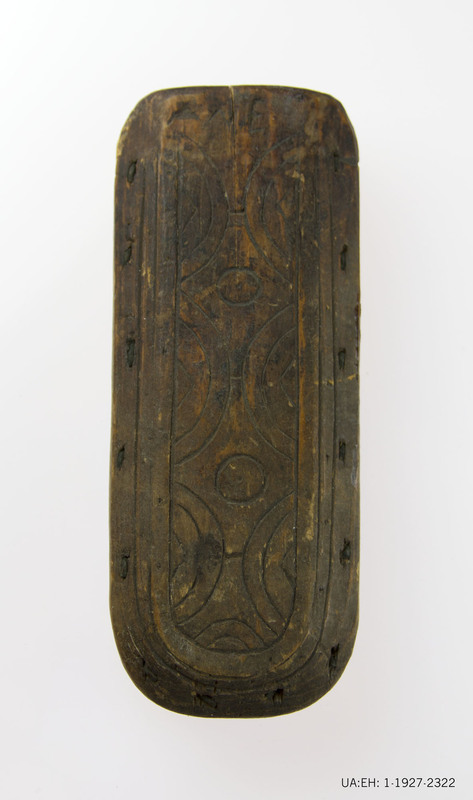 Some are elaborately decorated while others have simple lines and designs incising the ivory. Yup'ik story knife. University of Alaska Museum of the North. 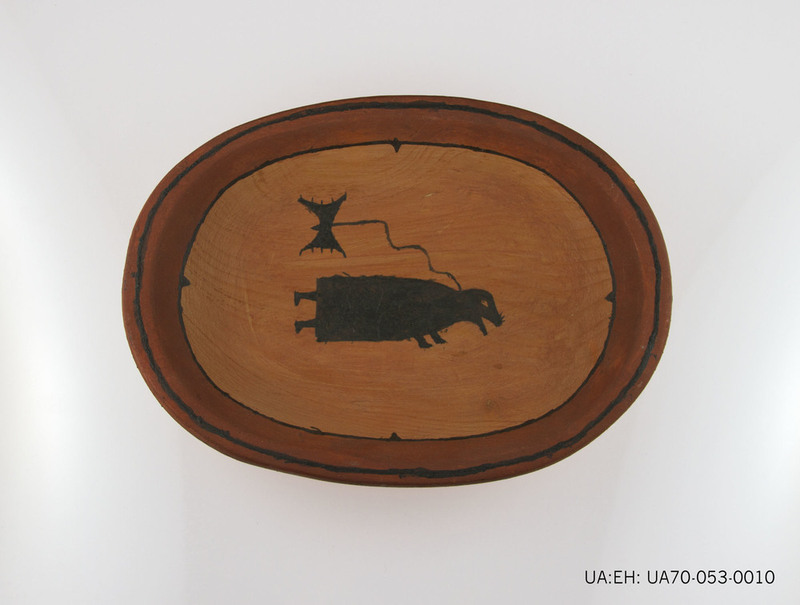 What I've come to realize in all of this is that the forms and lines of my work reference the many ethnographic objects I've come across in working at the UA Museum of the North. Much like the story knives, the universal nature of ceramics is such that it creates opportunities to share thoughts and stories with others. These ceramics vessels not only contain the food or drink we serve in them, they also contain these ideas of Northern culture via the forms I choose to make and the marks ornamenting the vessels. Perhaps the user will become aware of these ideas of community and culture in using handmade ceramics. The use of handmade ceramics parallels the use of the ethnographic pieces in the way that it represents a history and culture in addition to its inherent functional use. 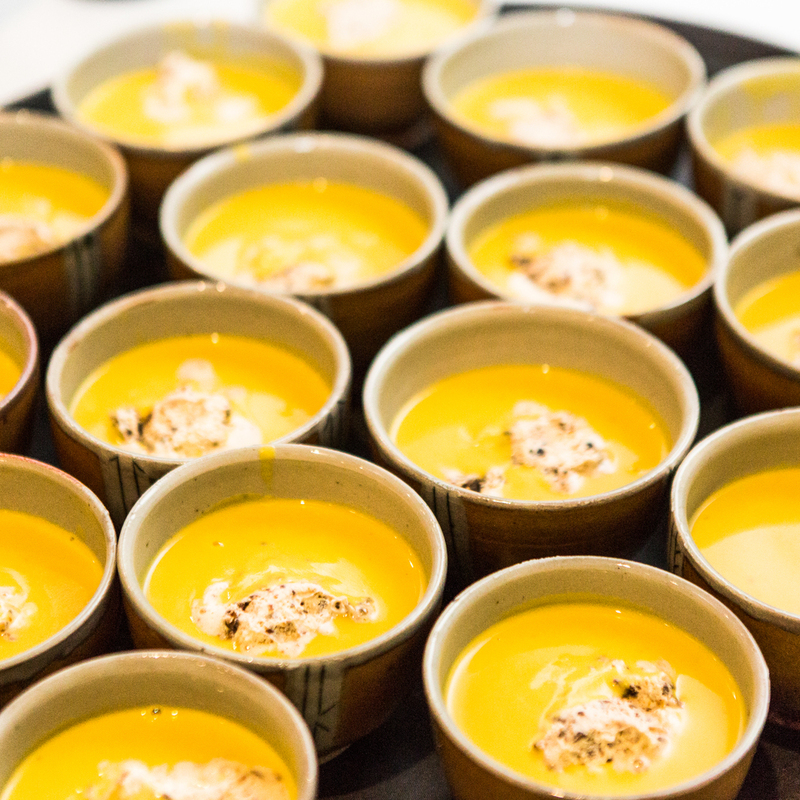 When we partake in shared meals, the vessels serve more than just their function, they then hold the cultural meaning, values, and memories of the shared event. I encourage everyone to enjoy handmade ceramics, no matter what the inspiration. It will surely embellish and enrich your own daily rituals. Cheers!